Make your projects look sharp! 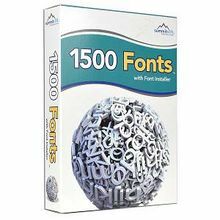 This Summitsoft 1500 Fonts software features 1500 high quality TrueType fonts that are perfect for business cards, scrapbooks, newsletters, invitations, greeting cards, presentations and other creative projects. It features Font Installer which lets you quickly preview and install fonts while protecting system fonts from accidental deletion. The Summitsoft 1500 Fonts software works with all of your applications and stays sharp at any size.